PBA Philippine Cup 2015 Finals - San Miguel vs Alaska Championship Game 7 - has just ended. Which team succeeded San Mig Coffee Mixers, now Purefoods Star Hotshots, as PBA Philippine Cup Champion? Just a recap first: Alaska Aces won Game 1 by 6 points (88-82), Game 3 by 8 points (78-70) and Game 6 by 11 points (87-76), while the San Miguel Beermen took Game 2 with a 14-point win (100-86), Game 4 by 18 pts (88-70) and Game 5 by 5 pts (93-88). 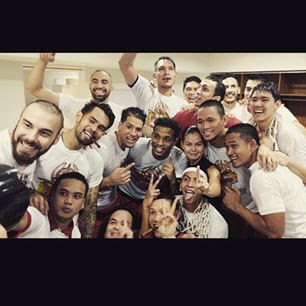 And the Beermen won Game 7 held earlier, January 21, 2015, at the Smart Araneta Coliseum, and was aired live via TV5. The San Miguel Beermen dominated 1st half of the game, with a huge lead that even went up to 23 points. But in the 3rd Quarter, Alaska Aces recovered big, cutting the lead, from 21 to just 3, and eventually become the leading team middle of the 4th Quarter. However, it still ended in favor of the Beermen, winning the 2015 PBA Philippine Cup championship by 2 points. Final Scores: 80-78. Arwind Santos was named Finals Most Valuable Player (MVP), his 2nd already after the 2011 Governors Cup. He averaged 18.4 points, 9.5 rebounds and 2.5 blocks in the finals series. In this Game 7, he had 22 points, 12 rebounds, 2 assists, 3 steals, 4 blocks, while his teammate, Conference MVP June Mar Fajardo made 21 points, 25 rebounds, 2 assists and 1 block, with 15 of his points scored from the first half. On the other side, Calvin Abueva led with 23 pts, 13 of which were amazingly scored in the 3rd Quarter alone. He made 14 rebounds.